Blueberry maggot was first detected in Wisconsin in the summer of 2016 in Adams and Sauk Counties. This pest feeds inside blueberry fruit and caused damage in commercial blueberry production in the eastern and southern United States, as well as in eastern Canada. This insect is expected to eventually have a significant impact on blueberry production in Wisconsin.Appearance: The adult blueberry maggot is a fly that is approximately 3/16 inch long and resembles a small housefly, but with dark bands on its wings. Larvae (or maggots) are legless and can grow up to 5/16 inch in length. Each larva has a single hook-like tooth at its mouth end. Blueberry maggots are very similar in appearance to the closely related apple maggot, with adults of both being virtually identical in size and appearance (including wing patterns). However, apple maggot does not feed on blueberries. Host Range: Blueberry (Vaccinium corymbosum) is the only commercially-grown fruit crop affected by blueberry maggot. Wild hosts include plant species in the genera Vaccinium and Gaylussacia including wild blueberries, lingonberry, dangleberry, deerberry and huckleberry. Symptoms and Effects: A single larva feeds inside each fruit causing the berry to become soft as it develops. Damage may go unnoticed until after harvest, when maggots crawl out of fruit and become visible among fresh fruit or in processed blueberry products (e.g., jams, preserves, pie fillings). Life Cycle: Adult blueberry maggots begin to fly in June or July, and continue to fly through August. Females feed and mate for at least one week before they move to blueberry plants to begin laying eggs. Females lay a single egg under the skin of a nearly ripe blueberry fruit and can lay up to 100 eggs during their approximately one month-long life span. Eggs hatch within one week and damage from larvae generally first appears in mid-July, continuing until blueberries have been harvested. Each maggot feeds in a single blueberry during its two- to three-week development. After completing their development, larvae drop to the ground and overwinter as pupae in the upper few inches of soil. A distinctive characteristic of the blueberry maggot is that, although most pupae develop to form adults by the following spring (completing one generation of the insect in a year), some pupae remain underground and do not mature for two or three years. 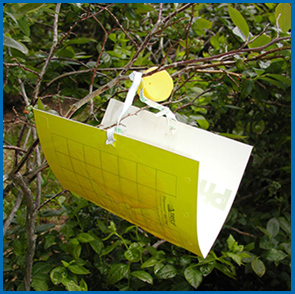 Monitoring: Monitor for blueberry maggot adults several weeks before blueberries begin to ripen (usually in early June) using yellow sticky cards impregnated with a feeding attractant (ammonium acetate or ammonium carbonate). You can buy cards that are pretreated with the attractant, or buy the cards and attractant separately and apply the attractant yourself. Fold the sticky cards in a V-shape with the yellow side facing down and put up two traps for every five acres. Because blueberry maggot is currently not widespread in Wisconsin, you can check cards weekly until you find the first adult. After this initial find, check cards every few days. Once you find an average of greater than one adult per trap for several days in a row, begin chemical treatments (see below). Note that the feeding attractant is not specific for blueberry maggot, so you may find other types of flies on the cards – use a hand-lens or magnifying glass to positively identify any blueberry maggot adults. Remember that blueberry maggot and apple maggot look very similar, but that apple maggot does not feed on blueberries, so flies trapped in blueberry fields/patches are most likely to be blueberry maggot. Once you have detected adults, you can also test fruit for the presence of larvae. Collect 100 berries from throughout your planting. Then break the skins of the berries and mix the berries with a salt-water solution (1 part salt to 4 parts water). Larvae will float to the surface. The number of larvae you find represents the percentage of fruit infested. Control: Cultural control methods can be useful in preventing blueberry maggot infestations. Remove weeds to eliminate habitat for blueberry maggot. Remove wild blueberry and huckleberry plants as these can serve as alternate hosts for the insect. Harvest fruits thoroughly and heat (to at least 120°F) or freeze any damaged or unusable fruits to kill blueberry maggot larvae. This is particularly important if you compost fruit, because blueberry maggot pupae can readily survive in compost and serve as a source of an infestation in future years. Clean soil thoroughly from equipment or beehives that might be moved between blueberry patches. Blueberry maggot pupae can easily be moved in soil. As noted above, start chemical control once you find an average of greater than one adult blueberry maggot per trap for several days in a row. Alternatively, if you have had a serious problem in the past, you may want to start sprays one week after you trap your first blueberry maggot fly. Continue sprays every seven to 10 days through harvest. Some reduced risk active ingredients, such as novaluron, spinetoram, and spinosad are most effective when used as soon as flies are found in traps. In addition, consider choosing a product that also provides control of spotted wing drosophila, another serious blueberry pest (see University of Wisconsin Garden Facts XHT1237 for details). Spinosyn, spinetoram, diamide, carbamate, pyrethroid, and organophosphate-containing insecticides are effective against both insects. Be sure to rotate use of at least two active ingredients with different modes of action to help delay development of insecticide resistance (see http://www.irac-online.org/modes-of-action/ for details), and be sure consider the effects of sprays on non-target (e.g., beneficial insects). Finally, because you will be spraying ripe berries, pay particular attention to the pre-harvest interval when choosing insecticides. Check the most recent Midwest Fruit Pest Management Guide (see https://learningstore.uwex.edu/Midwest-Fruit-Pest-Management-Guide-2017-P1785.aspx) for complete product recommendations. For more information on or help diagnosing blueberry maggot: Contact your county Extension agent.